Visiting Nurses Association of America tackles Blue Ocean Strategy as the healthcare industry continues to undergo changes. Hardwood Manufacturers Association stakes out new ways to create uncontested market space. Value Innovation presented at the Frontiers of Management Program in Brazil. Trombetta presented "The Blue Ocean Strategy Process in Action" in Vienna at the SMS conference. Blue Ocean Strategy featured at the annual Theater Communication Group's national conference in Atlanta. Blue Ocean Strategy was featured at the Yellow Pages Association annual meeting. Value Innovation and Ralph Trombetta featured in Baldwin-Wallace's Leading and Executing Innovation curriculum. Through our collaboration with universities and directly with corporations, we offer executive education workshops centered around the principles and application of Blue Ocean Strategy. These executive education workshops build a common language and are a starting point for the Value Innovation process. Senior managers and project team members are led through a series of presentations, case study discussions, and small breakout discussions, where they have several opportunities to apply the theory and tools of Blue Ocean Strategy to their business issues. 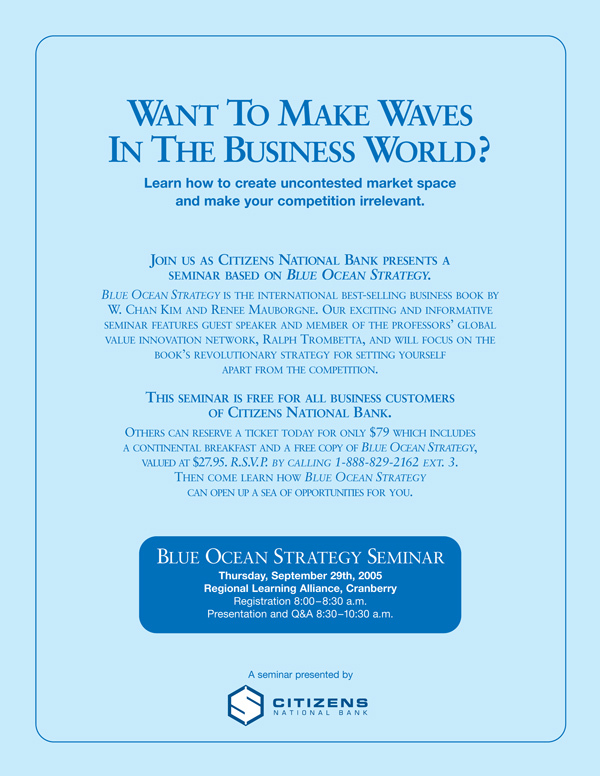 Click Here to download a description of an introductory Blue Ocean Strategy workshop. We understand that developing emerging business leaders needs to occur in an environment that allows individuals to think and reflect on the learning process. We help you to extract the maximum value from staff development programs with our action based learning programs, tailored to your specific needs. Our programs combine theory, case studies, skill-building and coaching to help your emerging business leaders to develop new strategic thinking and leadership skills. We believe that skill building takes place when your staff has the opportunity to apply what they are learning on your own real world business problems. Please contact us to receive a sample agenda from one of our action-based learning programs. "The feedback that we received on your MBA Blue Ocean Strategy seminar was very positive... I would rank this as a great success. Thank you again for taking the time to come visit us. It was an extremely valuable learning experience for our students". "I offer my sincere thanks for the exceptional presentation you made to our Executive Conference, "Leading Organizational Change,". Further, your examples and your videos were highly engaging and very helpful in clarifying concepts. Your presentation made a unique and highly valuable contribution to our overall program, and we heard many positive comments from conference participants! We are most grateful to you for participating in our Conference and for providing such a stimulating and important message." "We would like to thank you for sharing your expertise with us during FAHSA's 45th Annual Convention and Exposition. Thank you for providing us with a stimulating and useful session. The comments we received are very positive and they have indicated a strong desire to have you back as a future speaker." "Ralph Trombetta offered a wonderful keynote talk, on Blue Ocean Strategy and value innovation, with tailored messages and subsequent hands-on workshops for our Executive MBA audience at our 25th anniversary meeting. Over the years we have hired many speakers for our conference and Trombetta was among the very best that we have seen. I highly recommend him as a speaker and teacher of business innovation and strategy." "Ralph Trombetta brought thought provoking ideas and insight on innovation to the participants at the VNAA Workshop on Blue Ocean Strategy. We highly recommend this workshop." "Thank you so much for speaking last week at the Hardwood Manufacturers Association's National Conference. We had a long list of impressive speakers and we were delighted to have you on the roster. I know a lot of our members came away with how to take a different look at their businesses." "We enjoyed working with Ralph Trombetta on Blue Ocean Strategy at the HomeCare 100 conference. His interactive style and action-based learning teaching methods brought the strategy canvas to life for our businesses." "We strongly recommend Ralph Trombetta as an executive speaker. He delivered an insightful and practical seminar on Blue Ocean Strategy to senior executives at the LTC 100 healthcare conference." "Ralph Trombetta offers a wonderful experience for executives, with tremendous expertise coupled with strong applications into industry. We've worked with many of the top thought leaders across the globe and I would place Ralph in the top tier." "Ralph Trombetta presented "Blue Ocean Strategy" at the Northeast / Canada Regional Meeting for EMBA Directors at Fordham University in NYC. His presentation was outstanding. Everyone was engaged — Trombetta added much value to the meeting."